Instinctively humans rely on their senses so make sure your office isn’t negatively affecting their first impression. I’m coming you to live from Disneyland where I recently attended the D23 Expo. As we were entering the park one morning, I got inspired to grab my camera right there on Main Street and send you a message. 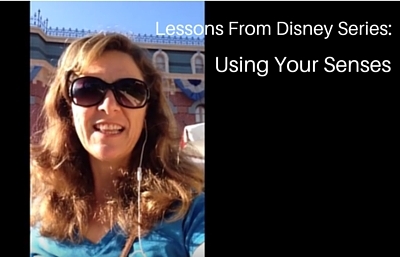 So I decided to shoot a special series: Business Lessons from Disney. By applying their business strategies you can get more patients, keep more patients, and increase your production. If you’ve ever visited a Disney park you know you have to walk Main Street to get into the park. Where they are exciting all of your senses, sight, touch, sound, and smell to hype up your experience for what is coming. The music is perfectly orchestrated to flow with the day. It is high energy early in the morning and gradually winds down to a softer beat as you are leaving at dark. The sights: there are lots of colors and eye-catching buildings and rides. And then they have the smells. It’s no accident they have bakeries and candy shops all along Main Street, where they actually direct the exhaust pipes into the streets so the smell just surrounds you and draws you in to buy the sweets. This is where I got the inspiration for you, just like Disney, with your patients while they are entering your office. Smell is powerful. It is primitive. Animals react to smell in a split second. And so does an anxious patient!!! Is your office visually appealing to patients who are seeing it for the first time? It is tidy and clean? And what about the smell? Dental smells is a big deal breaker.I’m sure you’ve heard of a commercial about being ‘nose blind’ to smells that you smell every day. You don’t smell your office the same way an outsider does. While most of the chemicals used for sterilization and treatment aren’t as noxious as they were in the past, you are still using lots of them for patient care. I want you to go through these and update them if needed. There are many more modern options out there now to find nice smelling disinfectants. Your office doesn’t have to smell like a hospital. Give it a smell that feels homey. This will really help very subtly in giving your patients a more pleasant experience. Have an outsider conduct a smell test, someone that isn’t in your office, preferably a female because they tend to be more sensitive to smell, and have them walk through and sniff around. It shouldn’t smell anything like a health care office in this age. It’s a simple task such as this that will really take you a long way keeping new patients and increasing your acceptance rate without any extra work on your part.